Choosing what will be the best hallway runners for your home can be a difficult task. From the style to the weave, many people got lost in the technicalities to choose the perfect piece for their interior. Hallway runners are one of the easiest ways to add colour, warmth and texture to inspire your hallway décor, and unify your interior. We’ve put together some top tips to help you choose the best hallway runners for the perfect fit for you and your home. First of all, there’s the more technical side of the rug that you need to pay attention to – fibres. When it comes to finding the best hallway runners for your home, fibres are an important factor to take into consideration. For the best hallway runners, you really need to opt for a durable fibre, or it won’t last for very long at all. Wool: Wool is a very durable and long-lasting fibre to opt for. It is quite expensive, but it is worth the investment. Wool is the warmest material that would be suitable for hallway runners and is naturally very soft. It is also very easy to clean, but it doesn’t stand very well against acidic spills such as wine. It also tends to shed, and may aggravate allergies. Polypropylene: This is a man-made fibre, and is also very durable and touch – and can even withstand cleaning with part-bleach solutions (but always check with your retailer first!). 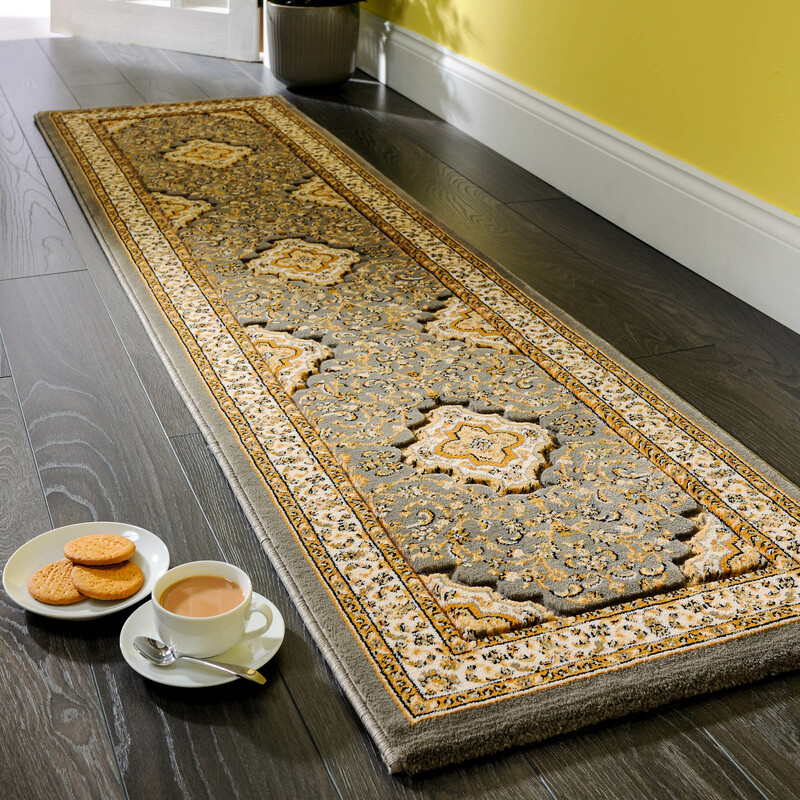 It is the best for hallway runners in high-traffic households as it is easy to clean, dry and is very durable. Jute: Natural fibres are seen as a good option for the best hallway runners. Jute comes in neutral shades and is reasonably durable – but is the least durable out of the choice of natural fibres. But it is also the softest choice out of all the natural fibres. 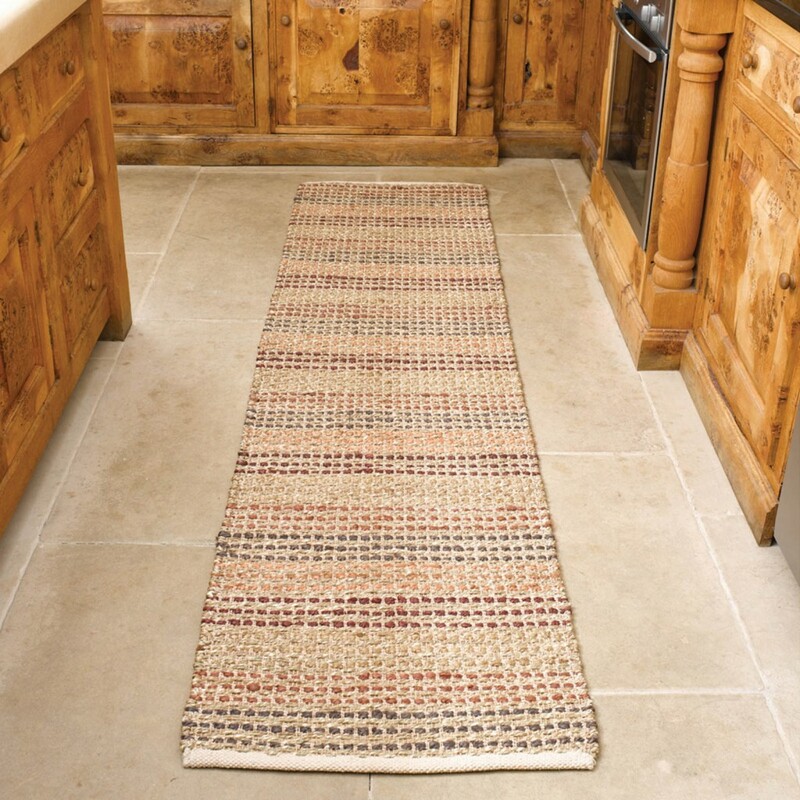 Jute rugs work particularly well in rustic style interiors. Sisal: Sisal is another natural fibre made from a type of hemp. Sisal is very hard-wearing when it comes to high-traffic areas and lots of footfall. However, but it does stain very easily even from water, and is quite difficult to clean. It does take dye quite well, so is the most likely to have a range of design unlike jute. Seagrass: Seagrass is like jute; in that it comes in mainly neutral colours from sandy beige to khaki. It is quite resilient and stand well against water and stains. It has a waxy coating so is easy to clean and maintain, and is durable and tough in high-traffic areas such as hallways. 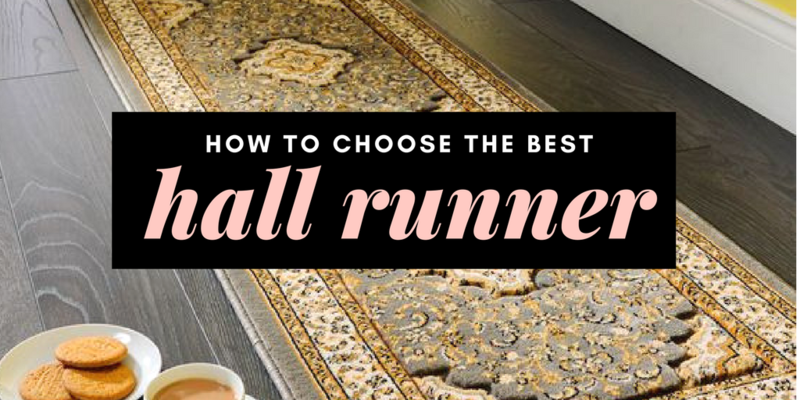 When it comes to finding the best hallway runners – you need to think what you want the purpose of the rug to be. Are you using the rug to lengthen the space or add more interest to a room in your interior you think is slightly lacking? Hallway runners are ideal for long, narrow interior spaces in the home. They can be ideal to change the look of a room’s space – by widening and brightening a room to give it the illusion of more space. As we mentioned in our guide to the best rugs for your living room, furniture is important to consider in the space when you’re introducing a rug. When it comes to the best hallway runners, you need to ensure all sideboards and coatracks are completely placed off the edge of the rug. This is due to the nature of runners intended to have the edges of the floor exposed as it runs through the middle. Placing the furniture on or partially on will make the room look cramped – so bear this in mind when you’re considering a hallway runner. In recent months, there have been more and more instances of the trend of hallways runners being used throughout the home. Using them in long, galley style kitchens or in a long and narrow downstairs bathroom or even on stairs – don’t feel you can only use them in the hallway, get creative! It would also make walking through those home spaces more comfortable. 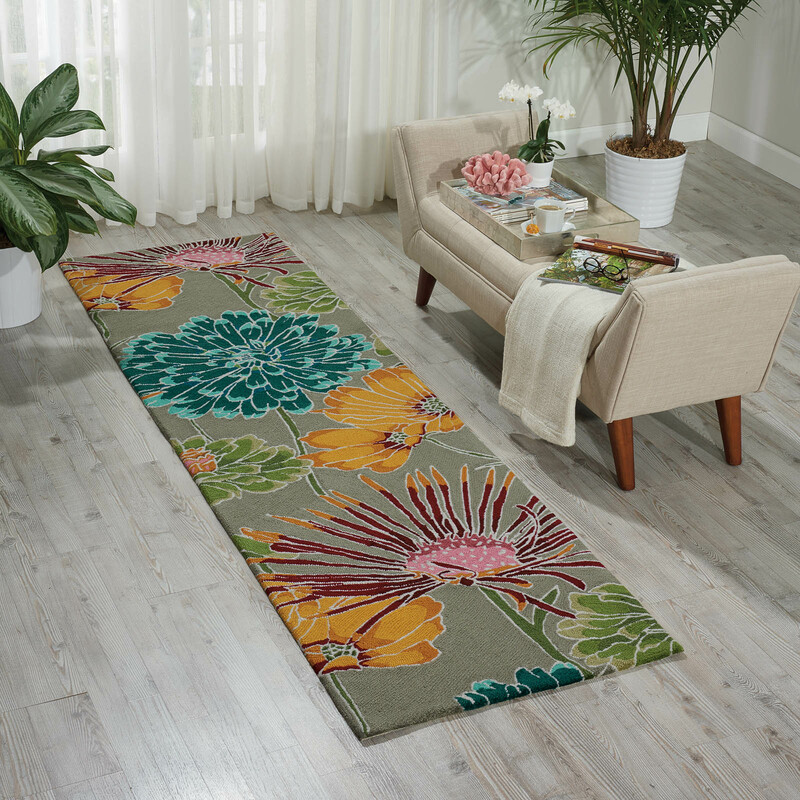 Whether they highlight the entrance to your home, or decorate the stretch of floor that leads to your bathroom, the right hall runner can be a piece of art. As hallways are a high-traffic area, be sure to choose a colour and a material that can tolerate a bit of wear and tear. 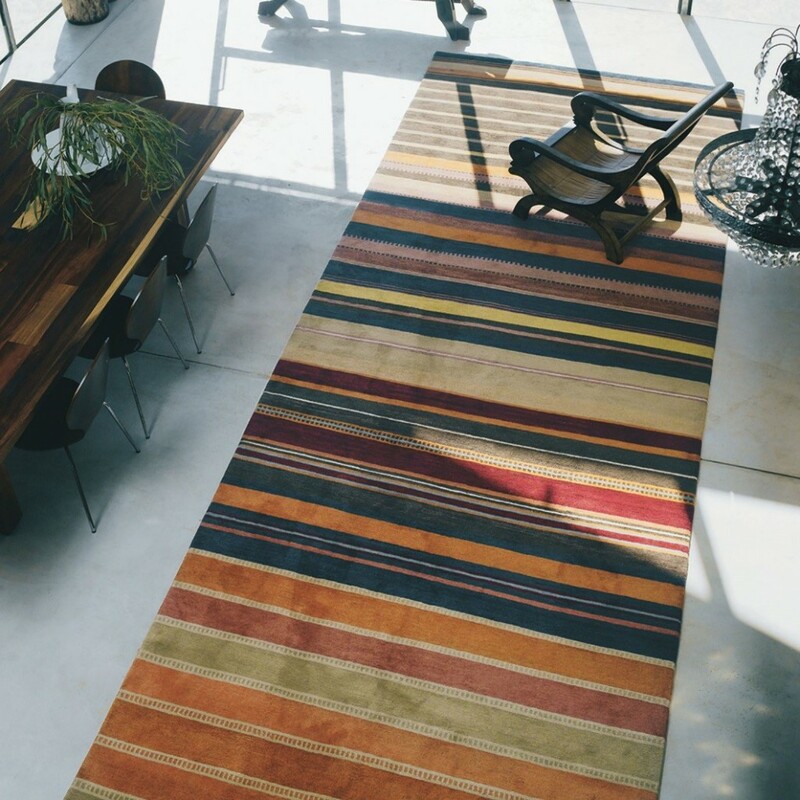 A colourful, boldly patterned rug is a practical choice as they’re very durable! When it comes to hard flooring, hall runners can help keep your floor a lot cleaner. They capture outside messes before they’re tracked throughout the house. They help to keep those dreaded footprints from spreading up your hallway. However, if you have a busy household the best hallway runners are ones that can be easily machine washed. 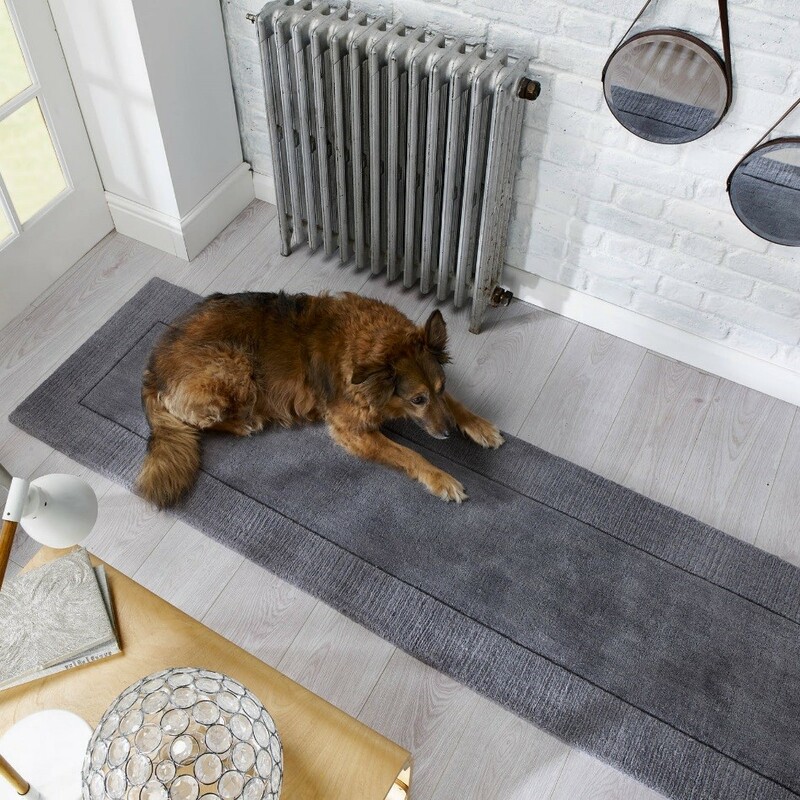 It’s a small factor that really can be a lifesaver when it comes to keeping your rug tidy. You should aim to vacuum the runner at least once a week. If it’s machine washable, wash it on an as-needed basis. Shaking or beating the runner outdoors helps a good deal as well to keep it looking fresh. Rugs on hard surfaces should always have a non-slip rubber pad placed under the entire runner. Hallways have the highest level of footfall throughout the whole of your home. And if they pose a trip hazard they really won’t work in your lifestyle. The best hallway runners will have a good combination of density and fibre. As the denser the pile (with closer tufting or stitches), the better your rug will wear. It’s a good idea not to go looking for a new hall runner without knowing the exact dimensions. Don’t forget to factor in door clearance and any furniture you need to accommodate when you’re measuring up. You should also think about how much floor you wish to have showing at either side of your rug. For a 1m-wide hall, the best hallway runners would be around 75-80cm wide. If your hallway needs some widening or brightening, you can use a hallway runner for this. Lighter coloured rugs in single or block colours can make a hallway look larger. A deeper colour with busier prints will help to cosy up a room and add some interest to a space that is sometimes overlooked. 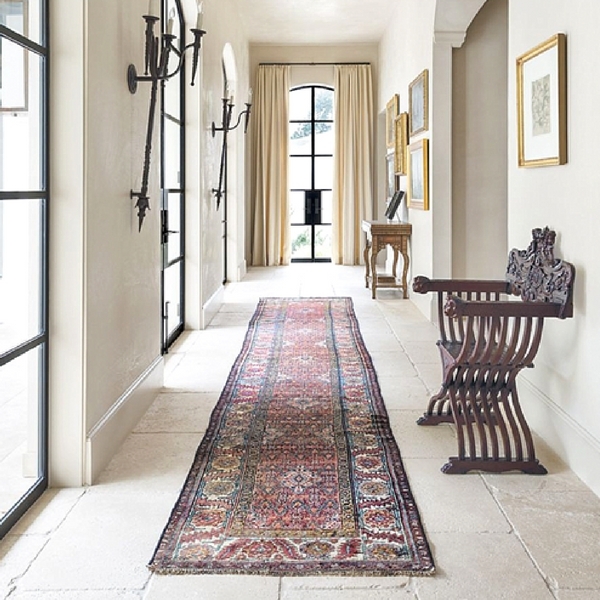 Hallway runners generally lengthen a space, as it draws the eye forwards. The best hallway runners for this are ones that have a border or lines running lengthways on the hallway runner. This trick is ideal for anyone with a smaller space or house that wants to give the illusion of spaciousness. When it comes to the colours for your hallway, think about how you want to work in an interior. Do you want the hallway runner to be the statement piece, or to complement other elements? If you have patterned or brightly coloured walls, opt for a plain and simple hallway runner. Or if you’re opting for a minimalist feel, pair a simple monochrome rug with subtly decorated walls. And a few statement pieces like vases in complementary colours in the space. Use this method again if you want to help ‘marry’ your interior with your rug. If the architecture is formal, perhaps a runner with a traditional design will work. If it’s more contemporary, you could go for something bolder. Hallways can be transformed by the simple introduction of a runner. We all know first impressions are important – and hallways are your interior’s first impression. If you have carefully created beautifully designed décor for your other main rooms, don’t neglect your hallway. The best hallway runners work to unify your interior and home. They can add a bright and cosy feel to your home instantly. Are you going to take the plunge and re-invent your hallway to the star of the show it should be? Hi! I’m looking for a rug JUST like the one with the dog in the hallway. Do you know where I can find this one? 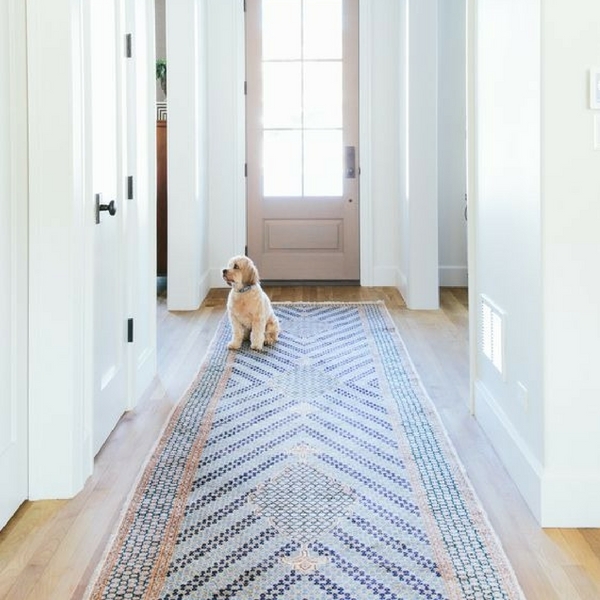 Hi,I cant find the correct link for the chevron rug with a dog sitting on it?